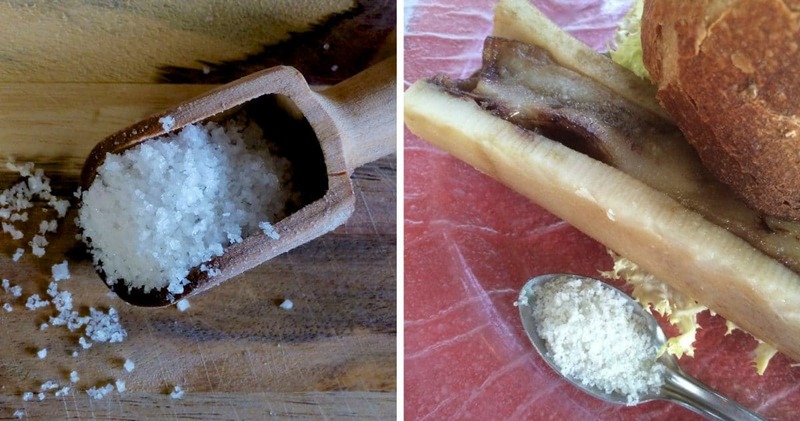 Do you eat bone marrow? You know the stuff inside the bone? Unless you are vegan, this underappreciated mushy part happens to be a fulfilling and delicious super food, that might bring out your most primal instinct. So simple, so cheap, and yet delicious, the os à moelle was a dish for the poor. It is making a strong comeback on the plates of many trendy restaurants. Full of protein, the bone marrow contains a high percentage of fat (about 96 percent) and is considered a high energy food. Loaded with micronutrients, stem cells, amino acids, collagen, and alkyl-glycerol, a cancerous cells killer, its health benefits include building the immune system, repairing wounds, helping with digestion, and fighting cancer cells. Of course, to obtain these advantages, you need to choose carefully the bones from a trusted butcher. They should come from healthy animals, naturally grown and grass fed only or the benefits might just dissolve and do you great harm instead. Remember the mad cow disease, how scary it was. People were so wary about buying beef. You could not find marrow bones for sale anymore. Nowadays, it is back on the butchers’ stands. Just make sure you can trace the origins of that beef. I am a big fan of bone marrow, always begging for the bones with the most of this juicy treat. So I am so happy it is popular again. Some native Alaskans eat the bone marrow of caribou and moose. In Kathmandu, Nepal, Sapu Mhicha, a leaf tripe bag, stuffed with bone marrow, is a delicacy. In some parts of Germany, beef soup is served with markklösschen or bone marrow balls. The bone marrow comes primarily from beef (commonly inside the femur), but you will find it also in veal shanks. You can find marrow bones in famous recipes such as Pot-au-feu in France, Osso Bucco in Italy, or Bulalo, a Filipino beef marrow stew. I won’t say it enough. Buy the marrow bones from a trustworthy butcher. Roast the bones upright at 200°C for 15 minutes in a pan so you don’t loose all this delicious juice. When the marrow starts to slightly bubble, it is ready to be eaten. You can use a marrow spoon if you can find one. This elongated spoon will come in handy, especially in a restaurant, so you don’t loose your table manners. Sprinkle with fleur de sel. The delicate salt crystals will just melt in your mouth, along with the soft and warm marrow. Heavenly. Pair it with a sharp parsley salad, served with a lemon and olive oil dressing. The bitterness of the dressing brings out the creaminess of the marrow. Marrow bones are perfect to add a strong meat flavor to a hearthy soup or to make a succulent broth. It could just be the paleo diet effect, however, bone marrow has made a strong come back on restaurant menus. So unleash your primal instinct and gnaw on these bones. It is nutritious, invigorating, and so delectable. The carnivorous animals knew it before us. They always go for the marrow. Watch how American Chef Ken Oringer cooks his bone marrow. You will never look at a bone in the same way again. Now, are you adventurous enough to try? Are you already a fan of bone marrow? I would love to hear from you. Share your recipes or thoughts in the comment section.